If you weren’t familiar with Bratt before this season, it’s no fault of yours. 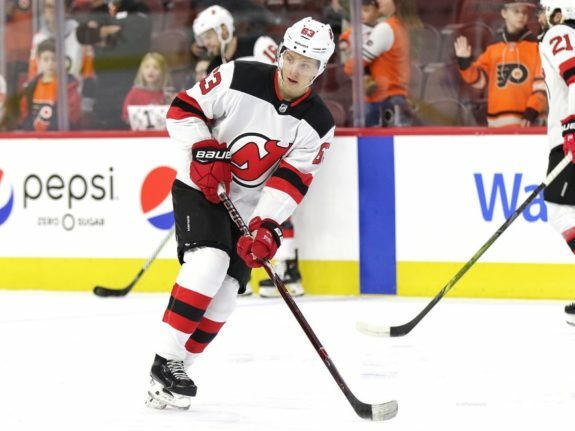 He was a sixth-round pick just in 2016 and was not expected to make the Devils’ opening night roster over prospects like Blake Speers and Michael McLeod. However, John Hynes and the rest of his staff caught notice of Bratt last summer, where he impressed in development camp and the World Junior Summer Showcase. It wasn’t long after Bratt showed he belonged in the NHL. He had a strong preseason and lit up the scoresheet to begin the regular season. Despite the hot start, he cooled off the significantly down the stretch. It was a tale of two seasons for Bratt as we look back on his first year in the NHL. We’ll start off by looking at what Bratt did well. In his first 44 games of the season, he tallied 12 goals and 18 assists. He also spent plenty of time on the Devils’ top line with Taylor Hall and Nico Hischier. Bratt particularly stood out in the first month of the season, where he had 12 points in 13 games. Although Bratt posted his best results in the first half of the season, his underlying numbers were a bit of a mixed bag. The Devils had a 47.7% Corsi (CF%) and were out-chanced 226-259 with Bratt on the ice. However, they did hold an edge of 89-83 in high-danger chances. Even though Bratt’s underlying stats weren’t the greatest, he still produced at five-on-five. In his first 44 games, he averaged 1.74 points per 60 minutes (P/60), which was seventh best on the team. He also made the most of his opportunities. At five-on-five, he had the highest shooting percentage of any player on the team at 16.7%. That’s not necessarily where you want to be, and as we’ll see in a bit, that number dropped by quite the margin. Overall, the Devils couldn’t have asked for more from Bratt through his first 44 games. He produced at a steady rate and gave them a winger who could keep up with Hall and Hischier. I’m sure the Devils coaching staff would’ve gladly taken it if you had told them that at some point last offseason. After being one of the Devils’ most productive players in the first half of the season, Bratt’s game took a sharp decline. In his final 30 games, the Devils had a 43.9 CF% with Bratt on the ice, which was second worst on the team to Brian Gibbons (min. 100 minutes played). 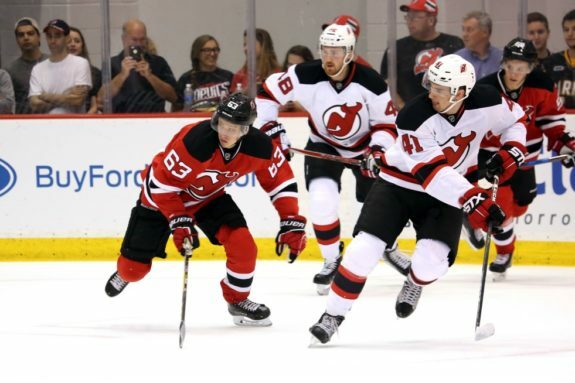 The Devils were also out-chanced 134-170 and outscored 8-23 with Bratt on the ice. Bratt’s production suffered as a result of his poor underlying numbers. He had just one goal and four assists and only fired 35 shots on goal in 30 games. I mentioned above that he had the highest five-on-five shooting percentage on the team in his first 44 games. That number regressed significantly from 16.7% to 0%, as Bratt had no five-on-five goals in his final 30 games. After being a regular, Bratt found himself as a healthy scratch over stretches at the end of the season. Having never played in a season longer than 48 games while in Sweden, Bratt admitted some of the rigors of the NHL season had gotten to him. With his rookie season over, Bratt will now have a full offseason of training to get in shape for 2018-19. I wouldn’t be too concerned about how his second half of the season went. For starters, shooting 0% at five-on-five is about as unlucky as he can get, even if he wasn’t shooting the puck that often. Second, he was a 19-year-old playing his first NHL season. Now that he’s experienced a full season, he will learn how to handle it better going forward. One thing Bratt needs to do is shoot the puck more often. For the season, he fired 100 shots on goal in 74 games, which comes out to 1.35 shots on goal a game. He also only averaged 8.7 shot attempts per 60 minutes, which was 20th on the team for any player to log at least 100 minutes. If he wants to become one of the team’s top scorers, then those numbers will have to go up next season. For a 19-year-old who was a sixth-round pick a little less than two years ago, Bratt had an impactful season. The key for him next will be finding the consistency to make him one of the team’s most reliable scorers. If he’s able to do that, then he should have no problem staying in the lineup in 2018-19.